Recently I gave an updated talk about GEDmatch.com for my local DNA special interest group, DIG, here in San Diego. GEDmatch.com is a DNA geek’s playground, but many less computer inclined folk find it difficult at first. 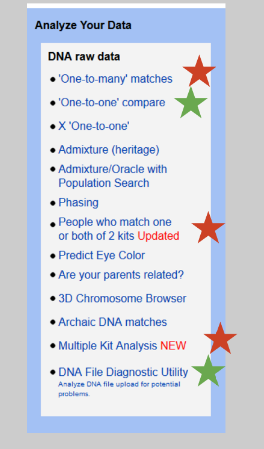 The new talk – http://slides.com/kittycooper/gedmatch-10#/ – covered uploading your data, how to manage your kits and mark a kit for research, and much detail on the one-to-many function as well as all my other favorite tools (starred in the image to the left). There is a new 23andme upload which is nice and fast as it uses the API so you actually log into your account there rather than uploading a file. It makes sense to upload all your kits when you have tested at more than one company but please mark all but one kit as research only, so DNA relatives are not confused by seeing so many versions of the same person. Why have more than one kit? Well they each test slightly different SNPs so it makes sense to compare apples to apples not oranges. In other words, if you have a new DNA match that has tested at a specific company you want to compare them in the one-to-one with your kit from that same company for slightly more accurate results. The one-to-many is the most important tool of all. Use it to regularly check for new close matches. I went over what each column is and discussed the generations listing. Note that you can sort any column by clicking the blue arrow at the top of that column. Normally it is sorted by total cMs. Here are the columns explained. In the generation listing your parent or child is 1, an aunt or niece is about 1.5, a grandparent is 2, for cousins subtract one from the number so if it shows generations of 4, the suggestion is 3rd cousin. My recommendation is to follow up with anyone who is 4.5 or less. Start with the closer ones. Accuracy in autosomal matching declines after 3rd cousins. I showed Blaine Bettinger’s chart for estimating a relationship from total shared cM (this has been updated recently see http://thegeneticgenealogist.com/2016/06/26/update-to-the-shared-cm-project ). You can do a one-to-one from the one-to-many by clicking the A. I included a number of examples including my Dad at two different companies (note the small breaks!). Also two full siblings will have many green bars, places where they are fully identical because they inherited the same DNA as each other on both paired chromosomes from each parent. A very useful feature is to select a group of people from the one-to-many and then look at all of them together in various chromosome browsers. Also you can get a CSV of their matching segments that compares everyone in the group to everyone else. Since it is sorted by person this is a quick way to add match information to your master spreadsheet or to start a spreadsheet if you tested at ancestry. I went over the 2D chromosome browser, also covered in my blog post here which compares everyone to just the first person in the list (you?). Next we looked at the 3D browser which compares everyone in the list to each other. You have to select each chromosome one by one. After the one-to-many and the one-to-one, I find the ”People who match one or both of 2 kits” most useful. It is a quick way to see which family line a new relative is part of by who else they match. Finally at slide 36 I got to the paid, tier 1, utilities. I use the matching segment search when I am interested in a specific segment. You used to be able to specify the segment but so few people used it that way that they turned into a listing of all your overlapping segments. The relationship tree only works if you have X and it was an experiment. I mentioned the lazarus tool where you can construct a kit or partial kit for a dead ancestor if you have enough descendants and relatives tested but did not have time to go into its details. Nice blog! You inspire me!!! I AM LOOKINGVFORWARD TO MEETINGBAND BRING MATCHED TO MY RELATIVES. Kitty I HEARD YOUR BLOG IS THE BEST. SHOW ME. Thank you for your blog. It is so incredibly helpful. I think it may inform us about why the site is free and I’m wondering about your take. Is GEDmatch collecting data and fine tuning its tools in order to sell the database and the tools to another entity or to eventually transition from a volunteer platform to a paid commercial platform? In other words, are users participating in GEDmatch’s research and development for future profit, rather than paying them in money? I agree. They have to state that for legal purposes, and to protect themselves from lawsuits. There is no “certainty” in this world–that is why insurance is one of the largest industries. Tomorrow is not only unpromised…it’s unknown. I am one of the many volunteers who assist them. Some of us programmers are just fascinated by DNA and want better tools than the companies provide. I have just discovered your blog and I love it!!! Thank you. I am somewhat new to all of this and I hope this is not a ridiculous question to ask. Once you have uploaded your raw DNA to GEDmatch I do not understand how to get your GEDmatch file so that you can put it on places such as Familysearch and other places. Would you be kind enough to explain this or point me in the right direction? Blessings to you. Your genealogy file (aka GEDCOM) and your DNA data are separate files and you are not the first person to be confused by this! Is it possible that two 1/2 sisters will share their x-match as two separate? 151.8 + 44.3 =196? or should it be one entire unbroken x? Two half sisters who share a Dad should have an unbroken X match BUT if there is a tiny error or series of no calls there could be a false break shown making it two segments. What company shows the break? GEDmatch usually ignores the no calls so it would be unbroken there. Ancestry to Gedmatch. I wonder if I try with the 23andme raw data if it will show the same break…..trying! Ok. This individual did not test with 23. SO, can I send you a screen shot? Just curious what you think. If I run the Gedmatch kits at differing times, will the results, in the reports change? Is new dna/genomes being updated in all of the GEDmatch reports? I noticed many reports were deleted in the MDLP. Kitty – thank for the great post. Any idea how many people (even roughly) have uploaded their kits to Gedmatch? Hi, your blog has great information. I recently tested and I am confused by my results. I am from USA and grew up in a single parent home where adoption also took place in previous generations. I knew my one parent said we had some american indian cuz we are rolled with a tribe. I am a tribal member too, Muskogee Creek Nation. I knew we had some sicilian. I don’t know what Red Sea dna is so I googled it and found Eritrean which use to be a part of Ethiopia. Is this correct? Is siberian just part of my native American heritage? I’m assuming west med represents Spain, Portugal and East med reps my Italy/ Greece (Sicilian). For the most part the results were similar. I was told my father was German and Irish but I’m not seeing any German. I was surprised to be so much British and Scandinavian. Is it possible that there is German mixed in with my British or scandanavian? Where did the west asian, red sea, and little ne african come from? Is it from the history of different tribes taking over regions so some people are mixed up or do I have direct lineage to these asian, african regions? Why is Spain considered a country in both Europe and Africa? Determining your ancestry composition from DNA testing is still in its infancy so understand that everyone predicts a little differently. There is no “German” DNA. North Germans look Scandinavian (also perhaps British), southern Germans look Italian, eastern Germans look east European, western Germans look French . Germany was a crossroads. Wow, that’s interesting I never knew that about Germany. I will look into this article, thanks! What is Red Sea dna? I’m confused? I see you mentioned that red sea, Mediterranean can represent your Jewish heritage but for me what would it represent since I don’t have Jewish ancestry that I know of? I am still trying to understand GEDmatch. Is there a tool I can use to compair two kits to see the shared matches to try to work out what lineage the person is on. Thank you. I’ve been using GEDMatch for a few months now and I’m puzzled with 1 feature – when I’m in the 2-D Chromosome browser I sometimes see a white perpendicular line between 2 chromosome pieces and in the right margin (overlap with previous match) it says “Old Branch”. What does this mean? I’ve been reading how possibly GEDmatch was used to find the golden gate killer. What is the best way to keep my info private, while still being able to research there? Hi Kitty, I my recent match shares 2 segments each about in 30cM, what would that mean? and how important it is compared to just a single segment. Once you get further away in relationship from your closest relatives, DNA gets more and more random and hard to interpret. So this could be a 4th cousin or someone more distant. Also the 2 segments could be on different lines so perhaps a 6th cousin twice. I am confused about my dna results. My results from various companies came back: half Asian and other half is slavic/central euro/balkan mix. However my mother’s mom is Asian and dad is European (which would make her only half Asian). My father is fully 100% European (slav/balkan/central euro). So how are my results came back as being 50% Asian? Could it be possible that I inhereted more of my maternal gradnma’s DNA? There are several possibilities and yes you can inherit much more from one grandparent. I got 28% and 22% myself. Please remember that DNA ethnicity is still an emerging science. Can you test your mother? It sounds like her father many not be who she thought but rather someone Asian BUT do not count on that from just the ethnicity prediction. Get some cousins on that grandfather’s side to test, preferably your 2nd cousins or 1sts. If they do not match you then he is not your biological grandad. yes i tested her and her results as expected, to be exact she got (60% Asian, and rest Euro), from the Asian side is was about 8% Siberian, rest is just East Asia. again ancestry composition is not a well developed science yet. 23andme has the best ethnicity of the testing companies, did you test there? Best to get cousins from each grandparent to test to be sure nothing unusual occurred. My Ancestry results show I am 12 percent Japanese. None of my family members in the family tree show Asian backgrounds. I uploaded my raw data to GedMatch. Is there a way to find only my Asian matches? Sounds like a Japanese great-grandparent and that this is not expected. Sorry if this is a shock for you. Are there other people in your family you can test? Get as many 1st and 2nd cousins as you can to do so. See if any of them have the Japanese also. No there is not a way to sort by ethnicity at GEDmatch BUT you could find your closest japanese match and then use the “People who match one or both of 2 kits.” Ancestry lets you select by migration group so if you have one for the Asian, use that. Also you can use the Admix calculators at GEDmatch to see that they come up with. I HAVE A MATERNAL GRANDFATHER(ISAAC FRANCIS WALRAVEN). HE APPEARED ON MY MOTHER’S HOSPITAL BIRTH RECORD AS HER FATHER IN A LEGITIMATE BIRTH. MY MOTHER WAS LISTED AS “RACHEL GALE” AND STEP DAUGHTER IN CENSUS RECORDS. HENCE, I HAVE BEEN SEEKING WALRAVEN KIN FOR DNA COMPARISON BUT WITHOUT SUCCESS BECAUSE THE FAMILY DESCENDATS ARE EITHER NOT INTO DNA TESTING AND THE FAMILY LINE IS DYING OUT. MY MATERNAL GRANDMOTHER DID NOT TELL MY MOM EXACTLY WHERE IN PA. SHE WAS BORN? GRANDMOM HAD FAMILY BIBLE AS EARLY AS 1905, BUT HER ENTRIES FOR HER IMMEDIATE FAMILY WERE NOT ACCURATE OTHER THAN HAVING 7 BROTHERS. SHE REMOVED BIBLE FROM OUR HOME AFTER GIVING TO MY MOTHER. THESE INCONSISTENCIES LEAD ME TO SUSPECT THAT ISAAC NOT GRAND DAD. IRONCIALLY, THE WALRAVEN, PARSONS, AND GALE FAMILIES LIVED IN KENT COUNTY MARYLAND AND INTERMARRIED. I HAVE DNA PROOF I AM RELATED TO PARSONS BUT NO SOLID DATA FOR WALRAVEN OR GALE. MY WIFE THINKS INCONSISTNCIES ALONE ELIMINATE ISAAC AS GRAND FATHER. I NEED BETTER STRATEGY TO PROCEED TO SOME SOLID CONCLUSION. HELP! You might find a few Walravens descended from your possible great grandparents and ask them to do an ancestry DNA test.